T-Mobile CEO John Legere today took the stage at Re/code's Code/Mobile event in Half Moon Bay, California, where he spoke on the new Apple SIM, demand for the iPhone 6 Plus, and the importance of selling the iPhone. According to Legere, the launch of the iPhone 6 and 6 Plus was T-Mobile's biggest phone launch the company had ever seen, and Legere called demand for the iPhone 6 Plus "mind blowing." He said that it skewed very differently from what the company anticipated, and while he couldn't comment on the current demand ratio, he said at one point it was around 55/45 rather than the 75/25 or 80/20 projected in favor of the iPhone 6. Legere said that while the backlog is coming down, it will be awhile before the company is able to provide devices to everyone. While on stage, Legere sorted out much of the confusion surrounding the Apple SIM, which is designed to allow users to easily switch from carrier to carrier with their iPad Air 2 or iPad mini 3. According to Legere, when bought from Apple, the SIM card in the iPad Air 2 and the iPad mini 3 offers customers complete flexibility, letting them choose Sprint, T-Mobile, or AT&T. iPad Air 2 and iPad mini 3 devices that Apple sent to T-Mobile and AT&T for sale include Apple SIMs that are pre-coded to each carrier, which means the SIM cards can't be used interchangeably. Because the iPads purchased directly from Apple are usable with any participating carrier (Verizon has opted out), Legere recommends that users purchase the iPad Air 2 and the iPad mini 3 directly from an Apple Store. Apple SIMs from an iPad Air 2 or iPad mini 3 purchased from the Apple Store and then associated with a T-Mobile plan will remain unlocked and usable with other carrier plans, but an Apple SIM activated on an AT&T plan will be permanently locked to the carrier, requiring a new Apple SIM if a user wants to switch plans. Legere also commented on the importance of the iPhone, stating that "[a] store without the iPhone is sh*t," and attributing much of T-Mobile's recent success to its partnership with Apple. Legere noted one of his tasks upon taking the reins of T-Mobile two years ago was to do whatever it took to land the iPhone, and he accomplished it, noting that he was willing to "get down on his knees" to make a deal happen. Just ahead of Legere's appearance at Code/Mobile, T-Mobile announced its Q3 2014 earnings, noting that it saw its biggest growth quarter in the company's history. T-Mobile added 2.3 million customers during the quarter (1.4 million postpaid net adds), with revenue up 10.6 percent to $5.7 billion. T-Mobile also announced that it hit its LTE goals for 2014, bringing LTE service to 250 million customers. Since 2013, T-Mobile has been on a quest to revamp the mobile industry with a series of Un-carrier initiatives that have thus far seen it uncoupling device fees from service charges, encouraging customers to switch to T-Mobile by paying early termination fees, offering a JUMP! upgrade plan, providing unlimited texting and 2G data in 100 countries, letting customers test drive an iPhone at no cost, offering free streaming music, and bringing Wi-Fi calling to all T-Mobile customers with compatible devices. 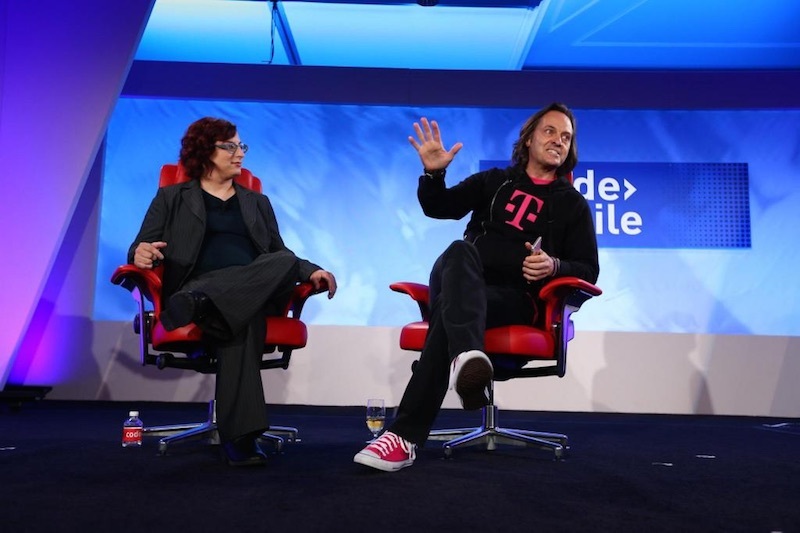 I think John Legere is one hell of a CEO and I T-Mobile has done an incredible job shaking up the wireless industry. That being said, T-Mobile's service (coverage-wise) is atrocious, I switched from Sprint (a really bad service provider in its own right) and I was impressed with the data speeds in the few areas that I had solid coverage but I had such little coverage that I ultimately switched to Verizon when I got my iPhone 6 and haven't looked back. Verizon and AT&T are the only good carriers in the US and while they're pricier than T-Mobile and Sprint, you definitely get what you pay for. Look at how much Apple has shaken up the mobile industry since the iphone was launched. The carriers will drop to their knees (figuratively or literally) to sell Apple's products, with no bloatware or customization or logos of any kind. This guy is the main reason I switched from Verizon to T-Mobile. I sold my unlimited Verizon plan for $600 once the iPhone 6 was announced, and now my bill is half of what it used to be. Customer service has been great, especially their Twitter support. I'll mention that their iPhone launch was absolutely terrible, but so was everyone else's. T-Mobile wouldn't even let new customers buy the phone online, only existing members. If T-Mobile service is good in your area, this guy is a great reason to switch. CEOs like this are very rare and need to be supported. I have an iPhone and I like it. Others for reasons I cannot quite get prefer Android and that's fine. I don't think they are **** though. His point seemed to be if you don't offer the iPhone you're ****, not that everything else is ****. The iPhone separated the tier 1 carriers from everyone else for a long time. It didn't matter if you actually ended up buying an iPhone or not; like car buying there's a halo effect to just having it available. I don't read his statement as disparaging other devices, though. Maybe this guy could run Apple when TC is moved out. For better or worse-there is not a (current) CEO outspoken like him. I wish we had a crazy carrier like that here. Love the 6+ on T-Mobile. Bill is never a surprise, and it's cheap! Speed in amazing. Unlimited data. Something every carrier should do. Wow, they actually gave preference to their existing customers over new customers. Frankly, that is darn refreshing in a networking company. I like the stuff that T-Mobile is doing. I like their ads. I like this CEO. If I wasn't so all in on Verizon and the service wasn't so solid, I'd switch. I'm keeping myself off contract on Verizon to keep that option open. But I have a lot of devices and don't know how well all of them would switch over to T-Mobile. I think the iPhone 6 would switch over fine. But I'm not sure about older iPads.